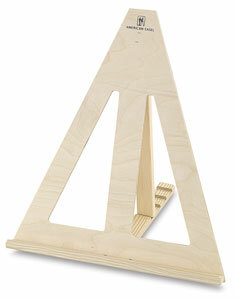 This small yet versatile table top easel has a multitude of uses. It's so lightweight, you can take it wherever you go, whether you're sketching, painting, or displaying at a meeting, gallery or art fair. It folds flat for easy storage and is fully assembled. The 18½" high × 17" wide × 14" deep base features an adjustable back leg. Manufactured in the USA from high quality fir wood, it will accept stain, paint, or any finish.